China | Where is Yvette? When I was about eight years old my favorite book in the entire world was a book about the first summit of Mount Everest by Hillary and Tenzing. My mother has commented since that she never should have bought me that book because just look at what crazy places I’ve since ended up to worry her, but to be honest I’ve never thought I’d make it here. Everest is like the moon, a place so far away one can dream about but there are too many obstacles when it comes to getting there. 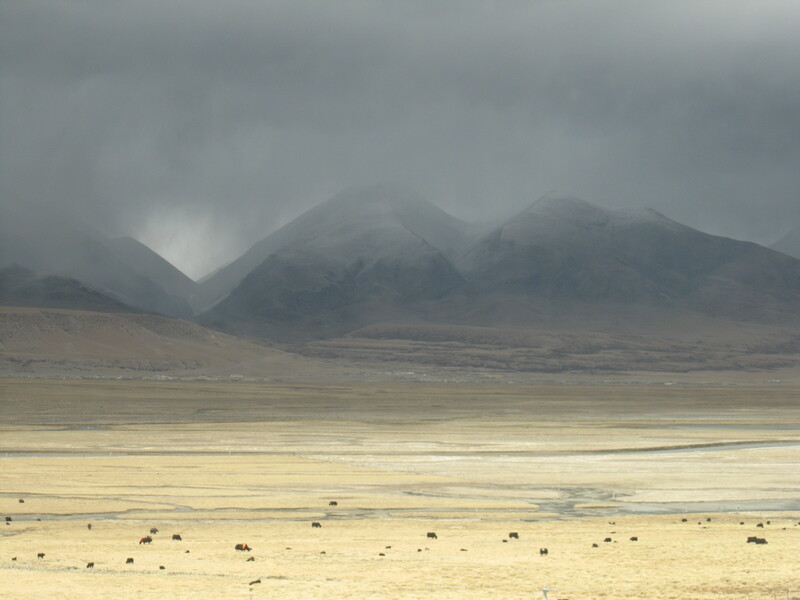 Driving south from Lhasa, it is no question that Tibet is devastatingly pretty. It’s also very empty particularly coming from China where everything was crowded together, and there’s a definite frontier feel to the whole place. 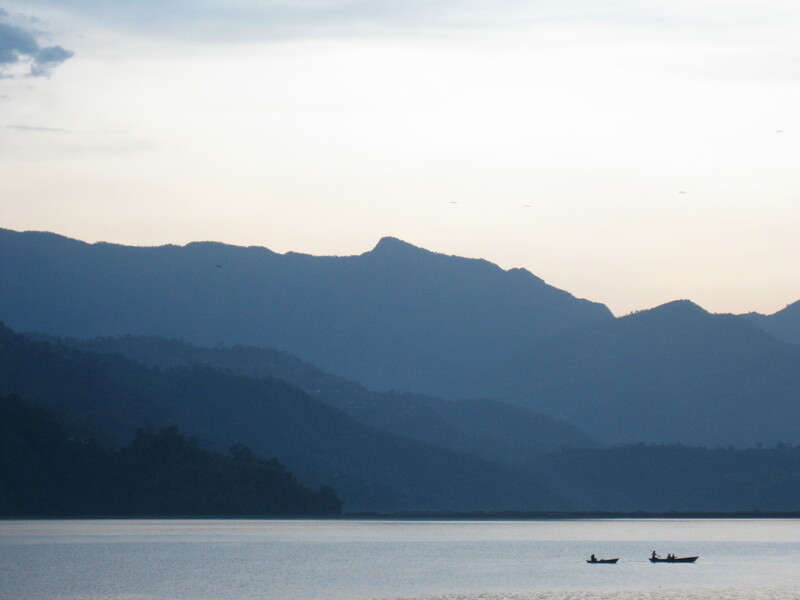 Posted from Kathmandu, Nepal- yep, made it to Everest, more later! 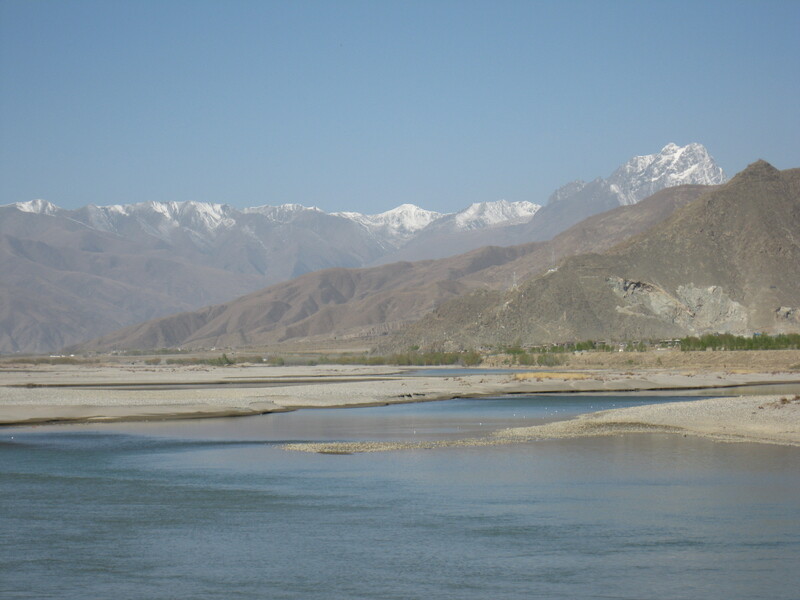 The Qingzang Rail line was opened in 2006 by the Chinese government to the tune of approximately US$4 billion dollars. It terminates in Lhasa, the capital of Tibet, after well over 2,000 kilometers (~1200 mi) depending on your starting point, and is one of the epic railway journeys in the world. 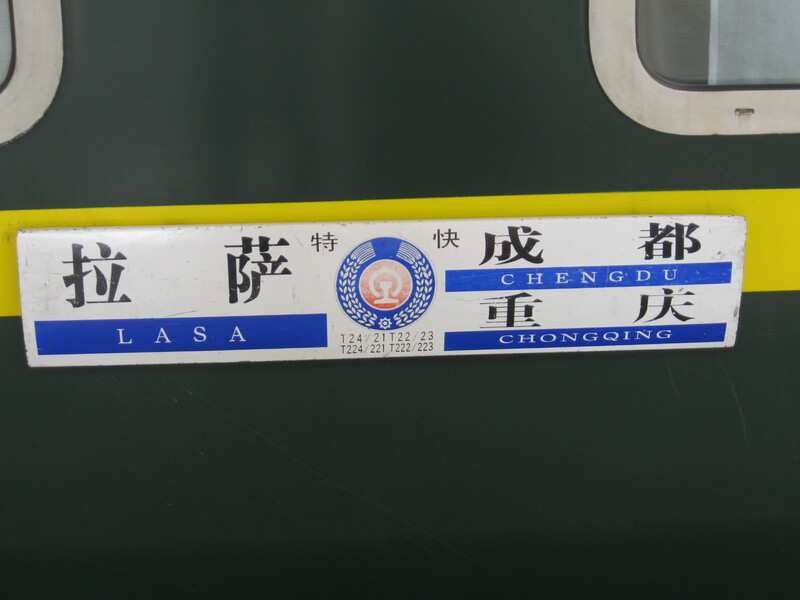 2:00pm: We “alight” onto the train to Chongquing from Chengdu where we have to make a connection to start the journey to Lhasa proper. This is done because despite it being a 48 hour rail journey to Lhasa from Chengdu the train tickets sell out very early, too early for tourists who show up planning to go ASAP to Tibet, but the train from Chongquing is 3 hours shorter and tends to have seats until the last minute. 2:05pm: It becomes clear that this connecting train is in fact a bullet train which travels at 200 km/hr (~124 mi/hr). This is greatly exciting. 4:10pm: Arrival in Chongquing. We head to the nearest Dico’s, an entertainingly-named fast food chain in China which has free wifi, to wait for our connection. 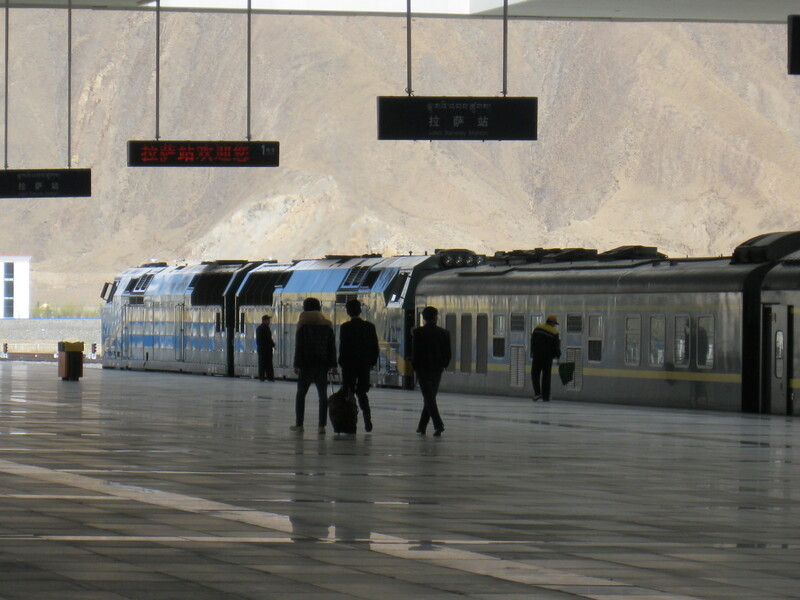 7:05pm: We decide to try to go find our train to Lhasa because it is an expensive, hard-to-get ticket to a place you need a special permit, so being on time is prudent. 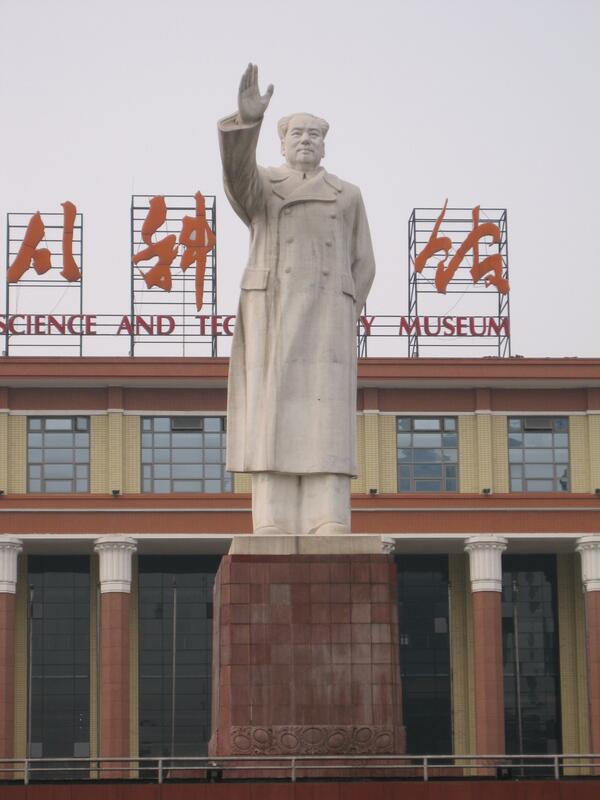 7:10pm: We learn that Chongquing has two train stations and ours leaves from the southern one. Our train is set to leave at 7:54pm. These two facts are the source of great excitement. 7:11pm: Running to the taxi stand occurs, and the urgency of the situation is conveyed by frantic pointing to the train tickets. The driver understands, and soon makes it clear he is the sort of person who turns taxi driving into an art form. He speeds. He weaves. He uses his horn liberally. We are in the presence of a Master. 7:25pm: The best taxi driver I’ve ever had pulls into Chongquing’s southern train station with a meter fee of 16 yen (~$2.50). We give him 25 yen and laughs in appreciation when we refuse the 5 yen note as he tries to give it back (in China, taxi drivers usually just take the few yen on the round-up as tip). 7:40pm: We make it onto the train to Lhasa. I breathe normally again. 7:54pm: Train leaves on time as scheduled. 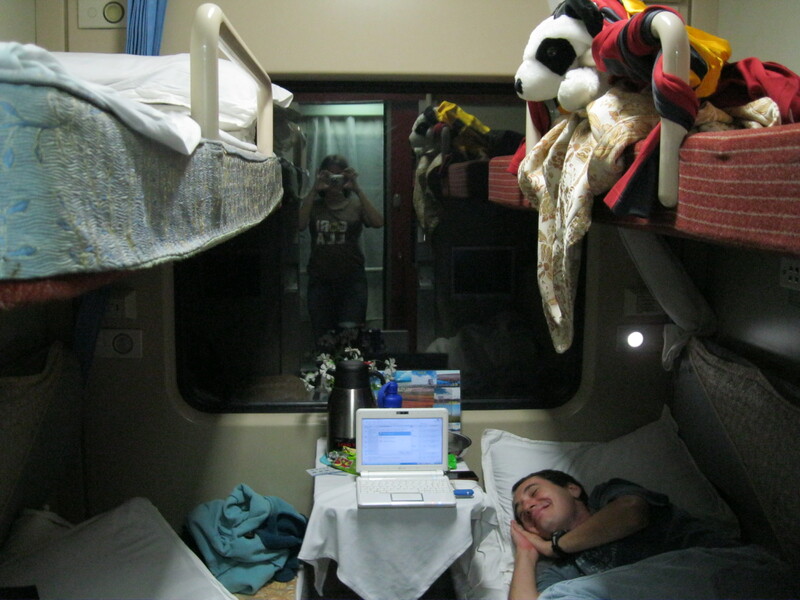 We are the only two people of four berths in our soft-sleeper (ie highest class) compartment, which causes some excitement. 8:30pm: Patrick out of premature boredom decides to transform the top bunk that I’ve magnanimously agreed to take into a fort for his lower bunk, stripping the sheets and blankets and dubbing it “Panderly Rock.” (We’ve been reading Game of Thrones lately.) I refuse to do it with the other side because there’s a good chance those two other guys will still show up (though it would have been christened Penguinfell if anyone’s curious). 9:02pm: The first of two Chinese guys who will share our compartment show up, with a “what the #%$* are these white people doing? !” look on his face. While he arranges his bags Patrick helps me remake the upper bunk. 11:15pm: Time to go to bed on the first of two nights on the train. 7:30am: It’s never fully quiet on a train due to the rails, even with earplugs, and it wakes me up and makes me realize I have to go to the bathroom. I’m a very light sleeper so this is actually the third time this waking up has happened during the night, making me realize sleeping on a train is likely a glimpse into what sleeping habits will be like when I’m a senior citizen. 11:30am: I decide to give this “waking up” thing another try in hopes that this one sticks. Over a Breakfast of Champions of fruit juice, bananas, and cookies I mention to Patrick that train life is sorta like prison in that you sleep a lot because you have nothing better to do (this is proven with how one of our Chinese compartment-mates pretty much slept through all of Day 2). 11:45am: During a stop in an unknown Chinese town I download new reading material onto my Kindle. During my travels I’ve abandoned paper books altogether because when you can download Bossypants by Tina Fey on the train to Tibet you know which medium has won. 4:25pm: We are kicked out of the dining car as they refuse to believe we’re still eating lunch after two hours. Jerks. 4:26pm: I should mention at this point that there are no scenery pictures from this day because the pre-plateau part of the rail journey wasn’t all that interesting, more like an arid hilly region. At this point however the train is slowly chugging up a ton of switchbacks through some mountains, and ta-da! the plateau begins. 7:30pm: I look out and realize it is snowing outside, and moreover that it’s still daylight when the sun set an hour prior in Beijing. This is because the Chinese don’t believe in time zones and run their entire country on one, meaning the sun sets in Tibet two hours later. 10:15pm: Bedtime occurs after the obligatory movie on my computer and reading and all that jazz. 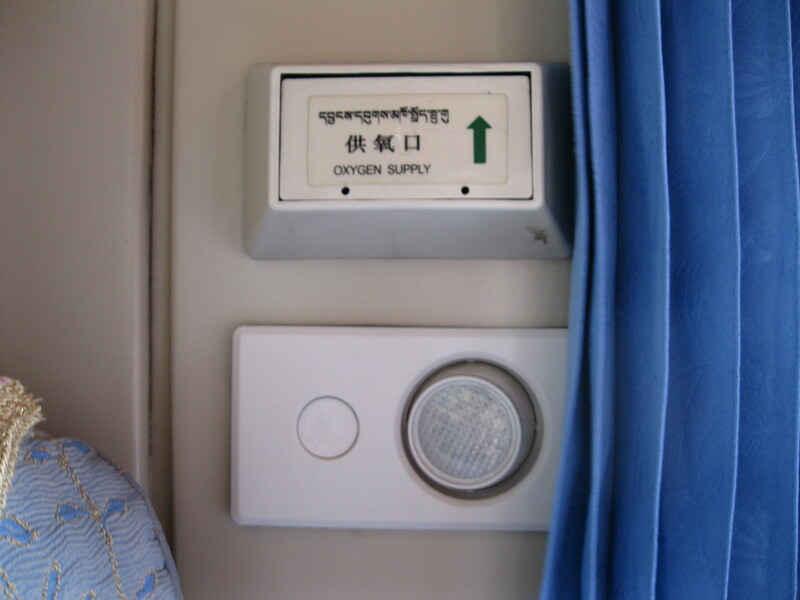 I play around with the personal oxygen supply a little should I wake up at the Tanggula Pass gasping for breath, which at 5,072m (16,640 feet) is the highest stretch of railway in the world. 3:00am- I awaken to confusion during which I realize my issue is the train has been stopped in a station for a decent time now, and more importantly that all our Chinese compartment-mates have gone. I migrate to the other now-freed lower bunk. 8:00am- I awaken to discover the plateau is covered in snow at this high altitude (80% of the Tibet section is above 4,000 meters, ie 13,000 feet). Judging by the picture-taking of the locals, this is unusual for this time of year. 9:00am- I never went back to bed as the scenery is just too captivating, and over time the snow disappears as we head to lower altitudes. We are on the 500km part of the track that was laid on barely permanent permafrost, meaning it melts in the summertime. The complicated engineering was hailed as a marvel until it became clear that it didn’t work in all the sections so some of them now have in-ground refrigeration in the summer. 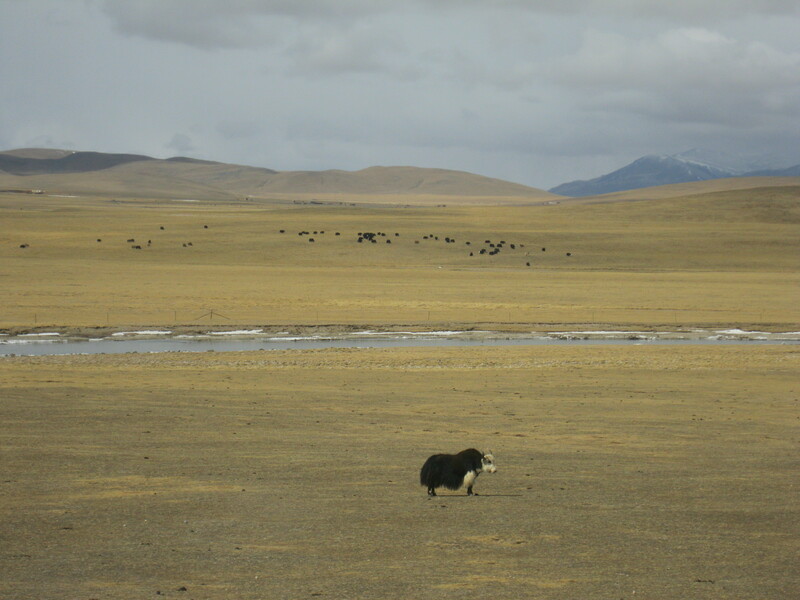 1:00pm- The first yak is spotted. Well the first yak close enough to take a picture of while the train slows a bit. There have been lots of sheep too. 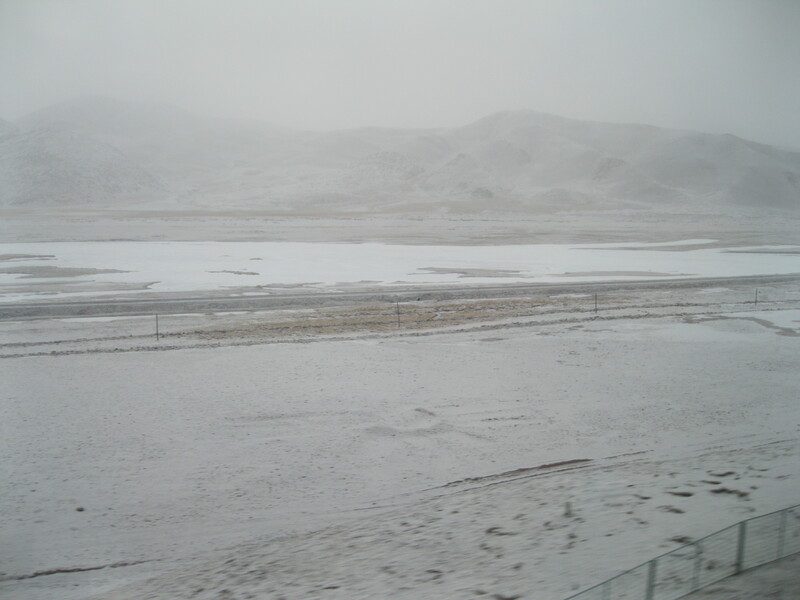 4:45pm- About 45 hours after we began, the train pulls into Lhasa. Unfortunately my attempts to take a picture of the train engine from closer (they were built by General Electric in Pennsylvania!) were thwarted by a police officer who didn’t want me to get closer. Welcome to Tibet! So that was the epic rail journey. All in all I classify this one as “something I’m glad I did and recommend but wouldn’t want to do twice” things because, um, Asian squat toilets aren’t terribly hygienic (and when you’re chugging water to combat the altitude you visit more frequently) and while everyone knows the Chinese love to spit it’s harder to ignore when a guy in your compartment is doing it a few feet away from you. But hey, it was all in all just what you’d expect from an epic railway journey on the Roof of the World! I was going to say a little more about Chengdu where this Mao statue is located, but I have a train to go and catch in a few minutes. After ~48 hours, that train which is the highest commercial rail service in the world will arrive in Lhasa, Tibet, elevation ~4,000 meters where our government-appointed guide/babysitter will pick us up. Incidentally, you need to sign a disclaimer promising you’re not a political activist before they hand over your Tibet permit. 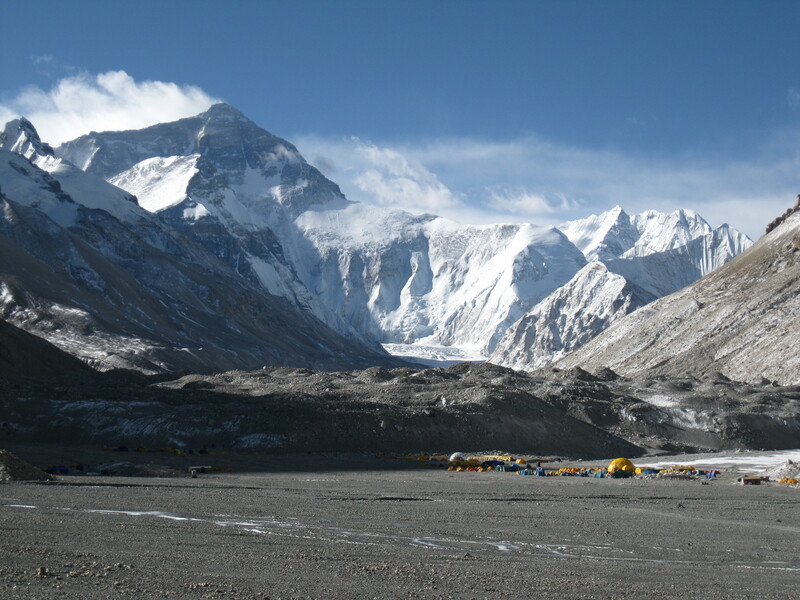 About a week later we will leave Tibet and cross the border into Nepal, but not before stopping a night at Everest Base Camp. 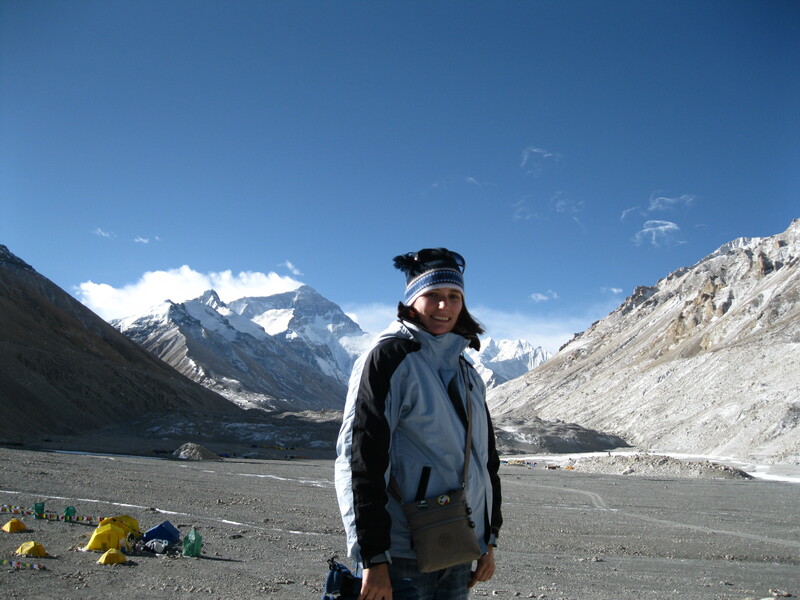 The roof of the world! Words cannot describe my excitement. Anyway, watch this space, I have a train to catch!